The ACC's top players during week seven. Offensive Player of the Week: TJ Rahming, Duke -- Rahming racked up 91 yards and a score on just four receptions in Duke’s big road win at Georgia Tech. 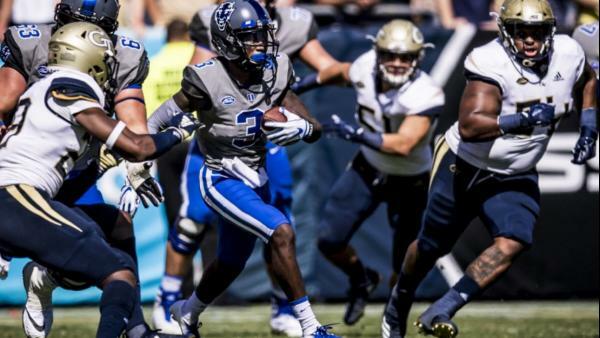 Defensive Player of the Week: Chris Rumph, Duke -- Rumph was everywhere, tallying four tackles for loss, a sack, and recovering a fumble, en route to a 28-14 victory against Georgia Tech. Special Teams Player of the Week: Maurice Ffrench, Pitt -- Ffrench returned a kickoff 99 yards to the house in a near defeat of unbeaten Notre Dame. Coach of the Week: Bronco Mendenhall, Virginia -- Mendenhall’s Cavaliers scored first, never relinquished the lead, and beat Miami 16-13. X-Factor of the Week: Juan Thornhill, Virginia -- Thornhill picked off Miami twice to help Virginia pull off the upset.